Many assume that quality is only available at a high price. You get what you pay for, so they say, so it’s only logical to assume that the more something costs the better it is. The outdoor power tools industry has proven this isn’t always the case. There are companies like WORX that are offering consumers innovative outdoor power tools and equipment at surprisingly reasonable prices. For proof, we present to you two of the most reasonably priced yet features-packed WORX Trivac leaf blowers currently available in the market. 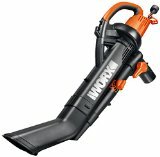 The WORX WG545.1 WORXAIR Lithium Multi-Purpose Blower/Sweeper/Cleaner costs average among other leaf blowers currently available in the market but can provide more functionalities than the others. Indeed, it’s several times less than the rest and thus a steal. But, we assure you: It’s no lightweight in terms of features. As the name of the WORX TriVac WG545.1 WorxAIR Multi-Purpose Electric Blower/Sweeper/Cleaner states, it functions not only as your leaf blower but can also be used as your cleaner/vacuum. This enables you to move, sweep, dust, inflate, deflate and dry up the debris from your lawn or garden or all sort of things even inside your house. This is made possible by its surprisingly easy conversion and various nozzles available that you can easily just attach to it. There are 9 nozzles that you can attach it with for different work you will need which are a long tube for longer reach, a dust brush, a short tube for quick cleanup, extension hose, dust nozzle, detail brush, wide nozzle, inflator and deflator nozzle. Thus, it’s more convenient and versatile than most of the other commercially available leaf blowers. It’s also compact and light (more or less 6.2 lbs), which makes handling, maneuvering, controlling, and storing it easy. But you should hang on tightly to it during use. It delivers air speed up to 120 mph, and 80 cfm. The rest of its features are: ergonomic soft-grip handle; body made of sturdy plastic; and since it’s powered with lithium battery, you can use it without worrying over tangled cords or giving off toxic emissions in contrast to using gas leaf blowers. It received a rating of 4.2 stars out of 5. 120 mph air speed with 80 cfm air flow and only 3.5 lbs. While the WORX WG505 TriVac Delux Blower/Mulcher/Vacuum 12.0 Amp with Metal Impeller costs lesser than the electric handheld leaf blower reviewed previously, currently available through Amazon with free shipping, it, too, is a lot less expensive than most of the other leaf blowers currently available in the market. Although this one doesn’t come up with the 9 attachments like the aforementioned leaf blower, this leaf blower still comes with a wide array of features:blower-mulcher-vacuum conversion at just a flip of the conveniently placed switch, angled tube that enables you to reach even hard-to-reach areas; ergonomic soft-grip handle; body made of sturdy ABS plastic; and large easy-to-couple-and-connect nylon collector bag. Thus, it is as effective and well designed as the electric handheld leaf blower reviewed previously. The only great difference is its capability of sucking the debris in and breaking them into smaller pieces. This one can work as a vacuum. It also received a commendable rating of 4.2 out of 5 stars. But if a lot of debris usually finds its way into your property, we suggest you buy the WORX WG505 TriVac Delux Blower/Mulcher/Vacuum 12.0 Amp with Metal Impeller instead of the WORX Multi-Purpose Electric Blower/Sweeper/Cleaner. The WG505 has a 14:1 mulch ratio. This basically means you’ll be able to mulch more leaves with this one. The former does so by way of its 2-stage mulching system. It has a shredder blade and all-metal impeller that chews up debris to a fraction of their original size, thereby enabling you to do away easily with even hard-to-deal-with debris like matted leaves. Some consumers are even happy to say that the impellers of their models chip easily. The other drawbacks to it that other consumers have aired online are: its collector bag is difficult to uncouple, its design doesn’t really make it easy to maneuver, and it isn’t as powerful as promised. And some find it quite heavy for comfort. Nonetheless, both WORX Trivac leaf blowers are enjoying success on Amazon. Given the above reviews of two of the most reasonably priced yet features-packed Worx Trivac leaf blowers currently available in the market, we hope you’d never settle when it comes to purchasing outdoor power tools for yourself. There are now so many from which you may choose, and each come with a unique set of features. To find the best one for you, all you have to do is choose carefully.